On the blog with me is Aman Thukral, a very young man whose running journey has happened infront of me on Facebook! 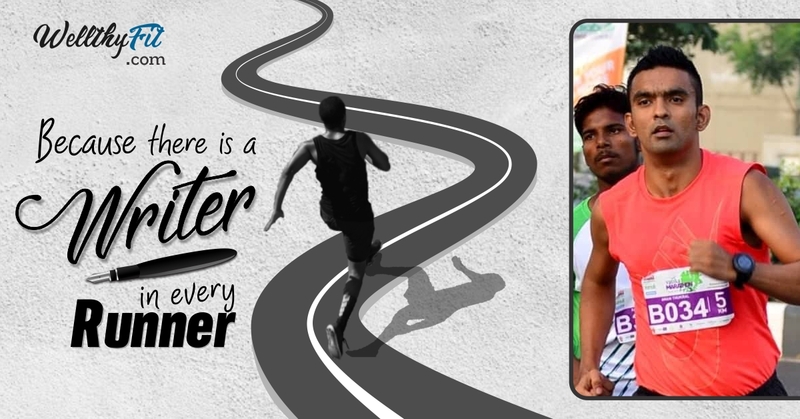 Aman started running in December 2014 and has participated in more then 35 events/races so far. He has participated in all race categories that is from 1 mile to Ultra Marathon (60km). On 2th December 2017, he did a self supported 75km running/jogging/walking session out of which 67kms was done inside Nehru Park in Delhi and the rest on road to raise money to help cancer patients. With dedication, training and most importantly guidance he has improved his timings in all distance categories. He sent me this article which I thought was worth sharing with the running community since many people are starting their running journey and many who have embraced the journey for years still need a constant reminder. Years ago Someone way older than me challenged me to run and I looked down at him and laughed. I said – let’s go and run right now, I sprinted for about 200 mtrs and could not do anymore and stopped while he carried on running with a smiling face. That did make me feel inadequate but this episode was soon forgotten. I was staying at my uncle’s house for a month or so and sometimes they mocked my paunch. On the positive side they encouraged me to use treadmill and when I shared my first session my relatives praised me. Even this treadmill running stopped after few days. Then often I saw my paunch hanging out and every time I used to get up and see myself in the mirrors at my workplace I did not like the way I looked. Felt that I am carrying a extra heavy bag wherever I go and it did make me frown. I started distance walking then distance running and everything improved. Running not only helped me to lose weight and look better, it made me love myself for many reasons,I got more energetic, it gave me the confidence to flirt with girls especially the ones I could not approach earlier because I got thinner and fitter and most importantly I got a solid purpose to live that is to keep trying to get better. Well that’s how running happened to me. But today I want to share an experience that could help you too! The weather was bad last night and subsequently the air quality but In my mind I was looking forward to the next morning to go out for a tempo run and had sub 12 mins as target for 3k which is a good target as per my current form. Just day before yesterday I was checking how people are doing on facebook and came across someone’s session which was way too fast and I thought I should atleast try doing 3k at that pace and then started romancing 11:55 minutes for 3km instead of 11:59. Even though 11:59 is hard and challenging enough for me. The next morning, I started running and the pace was sub 3:50 for first 400 mtrs though it should have been between 3:55 and 4:00. My mind gave me a signal that I shouldn’t go so fast. But I kept pushing because I was greedy and did not decrease speed. Anyways with determination and hard work I pushed and did 1st km in 3:48 pace and second even more challenging and tough in 3:56 and the 3rd km started and I saw disappointing 4:05 pace. I got mentally switched off and pushed pushed and stopped. I thought that if it was so hard to run at 4 :05 pace now, how would I finish at better pace or even slower for that matter if this is my condition. Even if I would have ran the last 740 mtrs at the pace of 4:18 which was possible I would have done 4km in sub 12 mins but it did not hit me then, because I was too down mentally. I saw myself getting breathless and feeling miserable at 4:05 pace and gave up immediately. The reason of 4:05 pace in the end was the first km was way too fast because of greed or over confidence. 2. If one speed session turned out to be good after very limited rest, don’t be over confident and expect every session to be good after not resting well. 3. If you romance someone’s pace, Respect his/her training and hard work and respect your efforts too but don’t change your target overnight and expect miracles to happen or sulk after not meeting unrealistic target in a very short span of time. Nothing wrong in wanting to be faster or wanting to beat someones timing be it for any reason but be calm and wise. 4. Don’t give up by being obsessed with one pace only , target pace is good because it helps you to be focused but aiming too high and stopping because you can’t do it does not make you feel good after giving up. I know neither me nor anyone gives up happily but push more and more before you make such a decision. 5. More than Speed , Greed to do faster than what you have trained yourself for kills you. Thanks Aman for sharing such valuable inputs! Every Runner has a unique journey. You are welcome to share your valuable inputs, experiences, thoughts and explore the writer in you! Send me your entries on tanya@tanyaagarwal.com or tanya.singla@gmail.com. More such stories please click here.